Why get hotel rooms when you can get much much more?! Here you get an entertaining 5 room GOLF VILLA with 4 bedrooms, 2 baths, a Fully Equipped Kitchen, and an entertaining Patio overlooking golf course sleeping up to 8 people, approximately 1100sf (if you want more space we can rent you next door suite that is inter-connected). The villa is sleeping up to 8 people, all under one roof, and with one 50 inch screen TVs and two 26-32 inch flat screens. Each room can be set up with 1 king size bed or 2 twin size beds. We are happy to offer you accommodation with the best location in the heart of golfer’s paradise in PGA Village. Why stay far away from the Course or Clubhouse & be dependent on a car? Here you will stay in a Golf Villa that is the absolute closest to the Clubhouse and right by the first tee and next to the complimentary 6 hole practice course. You do not have to wait for your friends when ready to hit the range or when hungry after your first round. You simply take a stroll to and from the clubhouse, less distance than a normal tee-shot. We are happy to offer you accommodation with PGA Village best location and the closest unit to the Clubhouse and driving range overlooking the first tee on Tom Fazio’s Ryder Course. The PGA Village Resort - Ranked among the "75 Best Golf Resorts" by Golf Digest. Golf Villas – our Golf Villas are the closest to the club house – why stay anywhere else!? Owned and operated by The PGA of America, and ranked among the "75 Best Golf Resorts" by Golf Digest, PGA Village in Port St. Lucie, Fla., serves as your Ultimate Golf Destination. PGA Village features the PGA Golf Club, with 54 holes of Championship golf by Tom Fazio and Pete Dye;PGA Center for Golf Learning and Performance golf instruction, practice, technology and fitness park; and the PGA Historical Center golf museum, home to the Ryder Cup Trophy. This Golf Resort is an alluring property features 54 holes of championship golf, villas with a bold, contemporary décor, lush landscaping, and expansive water features. Of course we will help you with any golf tee times or spa reservations. You can easily walk to the clubhouse that is less than 250 yards away. To secure superior golf course conditions, we recommend that you secure you accommodation first and research which course has the best course conditions along with booking your golf courses about 1-2 week prior to play. Designed by Tom Fazio, the first golf course named in honor of Rodman Wanamaker, who in 1916, inspired the birth of The PGA of America. A classic Florida layout, Fazio's Wanamaker Course, is set against a backdrop of wetlands, palm trees and palmettos, and is considered one of Florida’s most beautiful courses. Designed by Tom Fazio, the Ryder Course is named in honor of Samuel Ryder, the namesake and founder of the Ryder Cup, the pre-eminent event in golf. With its rolling hills, majestic pine trees and challenging water hazards, the Ryder Course has a distinctive Carolina-feel. With various hole locations, you could play this course every day and discover a different layout. Designed by Pete Dye, emphasizing the native surroundings and Dye's uninhibited style for creative design, the Dye Course features pine straw roughs, vast coquina waste bunkers and grass-based bunkers. A links-style course that weaves by the 100-acre "Big Mamu" Wetlands, the Dye Course offers pure Florida surroundings, with hints of design from the older British Isles’ courses for flavor. The spectacular PGA Historical Center is the key that unlocks the great history of the sport of golf, as driven by The PGA of America. The Resort restaurants are open to the public including, Sam Snead Tavern & Azur, two full-service restaurants adjacent to the courses, serves up the Nuevo coastal American cuisine using only the freshest organic food sources—seafood flown in daily, imported artisan-crafted pastas, cured Italian meats, heirloom herbs and vegetables sourced from local farmers... The Clubhouse features a restaurant and bar serving quality breakfast, lunch and dinners in a casual country club atmosphere. Florida’s relaxed, laid-back destination. Where palm trees rustle in gentle breezes, and sun-painted shores stay blissfully un-crowded. Take a boat ride down countless waterways or stroll past splendid shops, galleries and boutiques. 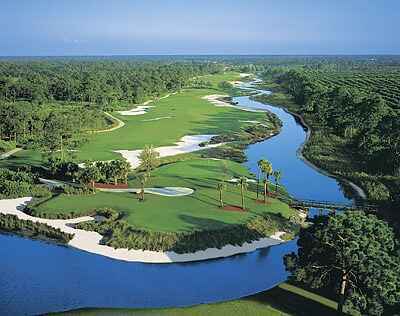 Take a swing at famed golf courses, cast away your troubles fishing and explore so much more. This area offers something for everyone: beachside and coastal towns where outdoor activities and nature take center stage; historic towns with tree-lined streets, quaint sidewalk cafes, restaurants, art galleries, charming antique stores and brand name stores you’re familiar with; ‘Old Florida’ towns where rodeos and orange groves, as well as cowboys still exist; and an old fishing village where fisherman still bring their catch to market each day and where world-class sport fishing tournaments are hosted every year.